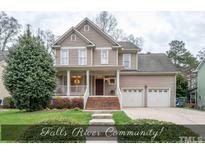 Below you can view all the homes for sale in the Falls River subdivision located in Raleigh North Carolina. Listings in Falls River are updated daily from data we receive from the Raleigh multiple listing service. To learn more about any of these homes or to receive custom notifications when a new property is listed for sale in Falls River, give us a call at 919-928-5027. Backyard in-ground salt-water swimming pool with steps-2015. MLS#2246513. 1930. Move right in, W/D & fridge convey! MLS#2246437. 1128. Greenway Swimclub Membership transfers with purchase. Buyer to pay dues. MLS#2244655. 2944. 2nd floor- 3 bedrooms, bonus Room & Master Bedroom boasts trey ceilings, seperate sitting area & extravagant custom his & her closets.Master bath w dual vanity, garden tub & seperate shower.Plantation shutters & crown molding.Tankless water heater & new HVAC. MLS#2242199. 3770. Large Backyrd Backs to Woods! Large Bonus Room! Invisible Fence! MLS#2235342. 1128. This home is part of the Falls River Community Association Inc. MLS#2236015. 4823. A community park is part of the HOA. MLS#2225401. 4823. Home backs to the Greenway Trail for extra privacy! ! MLS#2216447. 513.